We are going to be on the Carnival Splendor for 24 days on a Transpacific cruise from Long Beach, California, to Singapore starting October 5, 2019. We wanted to check out this ship before committing to be on this ship for 24 days, plus we expected to enjoy our 14 day Hawaiian cruise. The ship and the cruise were great, except for the very poor access to the internet. We were extremely surprised and very happy with the live music on the cruise. All of the live performers were very talented. Live music is a big aspect of our cruises. Eden Parker was the Piano Man on this cruise. Eden is extremely talented both in singing, playing the piano, and comic entertainment. We had him on our Transatlantic cruise and were pleasantly surprised to find him on this cruise. We like the size of the ship. Though not as big as the new mega ships, it was big enough to offer many live music lounges, bars and other venues. 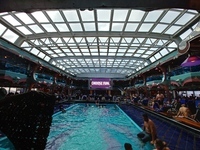 At no time did any area of the ship feel crowded despite the large number of passengers. We loved our balcony cabin. There was plenty of closet space. We were happy with the main dining room service, food quality and food quantity as well as the number of offerings. We were also happy with the number and types of food offerings at the Lido Buffet. However, the dinner options at the Lido Buffet were the most limited that I have ever found on any cruise. Usually only the Carvery was open as well as the 24 Pizza Pirate. But all the other Buffet Food Stations that were open for lunch were closed for dinner. This ship only has one specialty dining option, the Steakhouse. 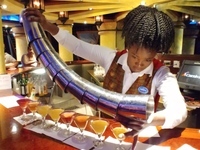 It is not like the brand new mega ships that have a multitude of specialty dining options. The service was excellent but I don&apos;t think we&apos;ve ever been on any cruise where the service was less than excellent. We did purchase a port excursion from Carnival for every port and were very happy with all of them. The tour guides were fluent in English and many of them were quite entertaining as well as informative. It was just my wife and I on this cruise. We did not travel with children. We would definitely do this cruise again. As mentioned above, we will be going on this exact same Carnival Splendor cruise ship for a 24 Day Transpacific Cruise in October 2019 and will be making 2 port stops in Hawaii again. The biggest disappointment was the internet. I&apos;ve taken many cruises over the past 3 years and the internet was fine. But the internet on this cruise was next to useless. They say they are going to upgrade it when the ship goes into dry dock on October 2019 but I hope they fix it before that as I&apos;ll be on a 24 day Transpacific cruise on this ship before it goes into dry dock. I did like this cruise and this ship enough to keep with my future 24 day cruise on it from Long Beach, California, to Singapore, in October 2019. However, I really do hope they fix the internet before that cruise. Mini Martini Tasting. My wife and I each ordered the Mini Martini Tasting. 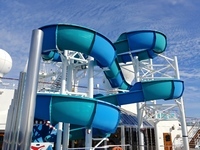 Water slide on the top outdoor desk of the Carnival Splendor. We are going to be on the Carnival Splendor for 24 days on a Transpacific cruise from Long Beach, California, to Singapore starting October 5, 2019. We wanted to check out this ship before committing to be on this ship for 24 days, plus we expected to enjoy our 14 day Hawaiian cruise. The ship and the cruise were great, except for the very poor access to the internet. We were extremely surprised and very happy with the live music on the cruise. All of the live performers were very talented. Live music is a big aspect of our cruises. Eden Parker was the Piano Man on this cruise. Eden is extremely talented both in singing, playing the piano, and comic entertainment. We had him on our Transatlantic cruise and were pleasantly surprised to find him on this cruise. We like the size of the ship. Though not as big as the new mega ships, it was big enough to offer many live music lounges, bars and other venues. At no time did any area of the ship feel crowded despite the large number of passengers. We loved our balcony cabin. There was plenty of closet space. We were happy with the main dining room service, food quality and food quantity as well as the number of offerings. We were also happy with the number and types of food offerings at the Lido Buffet. However, the dinner options at the Lido Buffet were the most limited that I have ever found on any cruise. Usually only the Carvery was open as well as the 24 Pizza Pirate. But all the other Buffet Food Stations that were open for lunch were closed for dinner. This ship only has one specialty dining option, the Steakhouse. 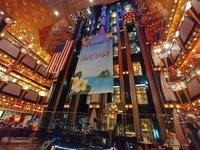 It is not like the brand new mega ships that have a multitude of specialty dining options. The service was excellent but I don&apos;t think we&apos;ve ever been on any cruise where the service was less than excellent. 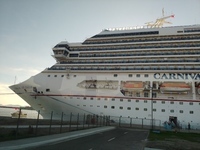 We did purchase a port excursion from Carnival for every port and were very happy with all of them. The tour guides were fluent in English and many of them were quite entertaining as well as informative. It was just my wife and I on this cruise. We did not travel with children. We would definitely do this cruise again. 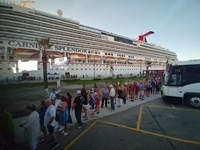 As mentioned above, we will be going on this exact same Carnival Splendor cruise ship for a 24 Day Transpacific Cruise in October 2019 and will be making 2 port stops in Hawaii again. The biggest disappointment was the internet. I&apos;ve taken many cruises over the past 3 years and the internet was fine. But the internet on this cruise was next to useless. They say they are going to upgrade it when the ship goes into dry dock on October 2019 but I hope they fix it before that as I&apos;ll be on a 24 day Transpacific cruise on this ship before it goes into dry dock. I did like this cruise and this ship enough to keep with my future 24 day cruise on it from Long Beach, California, to Singapore, in October 2019. However, I really do hope they fix the internet before that cruise. Board a motor coach at the pier for a drive to the spectacular blowhole, La Bufadora. Witness this natural phenomenon shoot water approximately 60 to 100 feet into the air through crevices formed in the cliffs. Browse the open-air market for local crafts. Start your tour with a leisurely drive through what is known as the "Hilo Walk of Fame for the banyan trees planted by celebrities & vitis Liliuokalani Gardens, the largest ornamental Japanese garden outside Japan. You will also view one of Hawaiis Iconic Statue of King Kamehameha. Enjoy expert commentary of Hilo Town as you make your way to Wailuku State Park and the picturesque Rainbow Falls. You will then continue to the majestic Akaka State Park, where you can see two gorgeous waterfalls: 100 foot Kahuna Falls and towering Akaka Falls which plummets 422 feet into an eroded gorge. Continuing with your journey to the famed Nani Mau Gardens where you will see spectacular orchid gardens and other rare plants and tropical fruit. You will sit and enjoy a delicious buffet lunch at the Garden Restaurant. Finally on the way back to the Pier you will discover a world of marine science at the only black-sand beach in the Hilo region. There are steps at the falls. Travel back in time as your guide takes you on a journey back to December 7th 1941. December 7th, 1941 will forever be etched in stone as the day Pearl Harbor was attacked, forever changing the world. Visit the World War II Valor in the Pacific Monument and the Arizona Memorial. In USS Bowfin Submarine Museum you'll also enjoy an audio tour. Next, a tour guide will take you aboard the USS Missouri where the Japanese surrendered and the war in the Pacific ended. Continue to the Pacific Aviation Museum which traces the history of air battles throughout the Pacific. Your luxury air conditioned mini coach features custom seats, seat belts, cell phone charging stations and immense viewing windows. There has been damage to the dock at the USS Arizona Memorial. Unfortunately, guests will not be able to step onto the Memorial, however, the tender boats will bring them as close as possible for viewing & photographs. This VIP tour features a combination of three spectacular locations in Maui that you can visit in one day. Start with the famous Iao Valley recognized as a very special place for both spiritual value and spectacular scenery. Take a walk on the Iao Needle Lookout Trail and Ethnobotanical Loop and learn about the plants that Hawaiians brought. The second stop is at the Ocean Vodka Distillery and Farm. Here, you will be taken on a guided tour where you'll learn how vodka is made from sugar cane, mineral water and other fascinating ingredients. Take in a spectacular panoramic view from the foothills of Haleakata, feel a tropical breeze making its way across the island, and experience the birth of world-renowned premium spirits. This tour includes a sampling with a take-home OCEAN Organic Vodka shot glass souvenir for those that are 21 and over. Last but not least, you'll stop at the Lavendar farm, where you get to walk at your own pace through beautiful walking paths with breath-taking views. A picnic style lunch will be provided in this beautiful outdoor setting filled with stunning views and panoramic out-of-this-world landscapes that includes a birds-eye view of Maui central.